Idealistic, misguided Morten Falck is a newly ordained priest sailing to Greenland in 1787 to convert the Inuit to the Danish church. A rugged outpost battered by unremittingly harsh winters, Sukkertoppen is simmering with the threat of dissent; natives from neighboring villages have unified to reject Danish rule and establish their own settlement atop Eternal Fjord. As Falck becomes involved with those in his care his ambitious catechist, a lonely trader s wife, and a fatalistic widow he comes to love his faith and reputation are compromised. The internationally acclaimed novelist Kim Leine charts the tragic events that connect these seemingly disparate lives, while illuminating the brutal and tender impulses of those seeking redemption and the shifting line between religion and mysticism. This was one of those where I should write a beautiful meaningful review. Talk about language, writing, tone and style. But you all know that is now how I review, those days are long gone in uni. But so that you know, the writing was beautiful and there was this longing sad tone to it all. 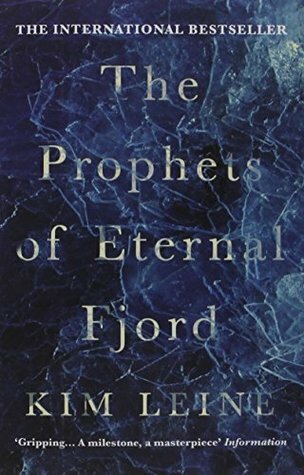 And as it was a translation of a Danish novel, then I must say it was very well done. The translator really got the spirit of it all. As I have not read the Danish one I can not compare, I have not read a Danish book since Uni. I had to check and it seems they only have an older book in Danish by the author. It's not one of those books you read fast, some books just needs to be read slowly. The be savored. Oh I like good writing. The story is about Morten Falck, a young man who wants to become a doctor, a man who loves his sketches. But his dad wants him to become a priest. Morten is not the best of men. His faith is in question, he is intrigued by everything and easily led astray. And he certainly should not have gone to Greenland. Greenland, oh you will not come out liking the Danes when you are finished with this one. Not one bit. They came, they conquered, they said this is ours. They raped, they pillaged, cos hey, those savages are barely human after all. Also you can kill them as long as they are not Christian. The land itself is harsh, even to those that live there. The only problem I had was the narrative at times. It tended to jump in time back and forth a few times, and then there was this passage from a POV, and I did not even know who it was until the end. I do not like books that end and then begin. That is kind of spoilerish isn't it. A happy book? No. But then it those deal with some pretty heavy things. Mankind is never nice. I love your review and it's great to find a book you can savour like that!